i have ordered a lot of things from fs reloading and i will keep on ordering things from fs reloading they are very great people and they get there stuff out fast they pack every thing great and the prices is the best and so is the shipping i have ben telling all my frinds about..
Love Lee products, Durable ,priced right, Read Dr. Lee's Book and open your eyes. .. These ammo boxes have light surface scratches and scuffs that don't impare function. The are sold as is without warranty. This empty FS Reloading brand plastic ammo box can store up to 50 rounds of .38-.357 Magnum and similar sized pistol cartridges. 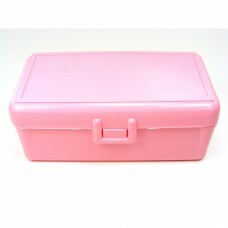 Boxes are available in seven solid colors (Amber, Blue, Green, Pink, Purple, Red and Black). The live hinge on FS Reloading ammo boxes undergoes a crimping process while the hinge is still hot from molding. This crimping aligns the plastic molecules in the hinge, greatly extending hinge life. The live hinge employed on FS Reloading ammo boxes has been tested to 2 million cycles. Hinge flexibility has also been tested to 0 F.
Unlike other brands that force you to invent your own solution for cartridge rattle or purchase expensive foam sheets separately, FS Reloading Brand Ammo Boxes come with a custom cut lid liner pre-installed. Our exclusive, pre-cut foam lid liner (shown in the image at right), which is included at no extra charge, gently holds cartridges securely to prevent that annoying rattle so common in other plastic ammo boxes. And if you are concerned about bullet creep from cartridges repeatedly sliding up and down in the box, our foam lid liner will put your fears to rest. 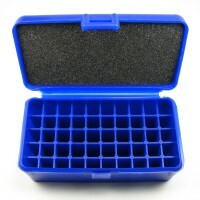 When you compare features and price with other brands, we are certain you will find these ammo boxes a fantastic value. Available in seven solid colors, Red, Blue, Amber, Pink, Purple, Green and Smoke. Stores 50 rounds of .38-.357 Magnum and similar sized pistol cartridges. Made from high impact, injection molded polypropylene. Interlocking lugs make boxes securely stackable. Pre-cut foam lid liner prevents cartridge rattle. Gusset reinforced corners for extra durability. Maximum Overall Length is 1.66"
The FS Reloading Medium Pistol Ammo Box will store 50 cartridges having a maximum case diameter not over .38" and an overall loaded length not exceeding 1.66". 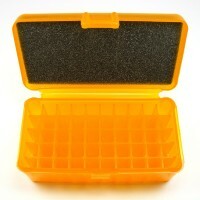 This FS Reloading brand plastic ammo box stores 50 rounds of .38-.357 Magnum and similar sized pisto..